Welcome to the on-line Japanese dictionary developed by Free Light Software. The program is written in java and it allows you to carry out complex operations like displaying Japanese characters without Japanese computers. The major setback is that all the browsers don't support Java, especially the 1.1 version. If you find any problems on displaying our program, please refer to: "Compatibility" and "Trouble Shooting" in "Japanese E-mailer Hikyaku". The product is a little different but the technique used being the same (applet written in java), the problems and the solutions should be the same, too. After fully understood the content of this manual, you should return back to the page corresponding to your browsers: MS Explorer 4 - 5.5, or Netscape 4.5 - 4.7. If your problem remains without solution, Please post your question on discussion forum. 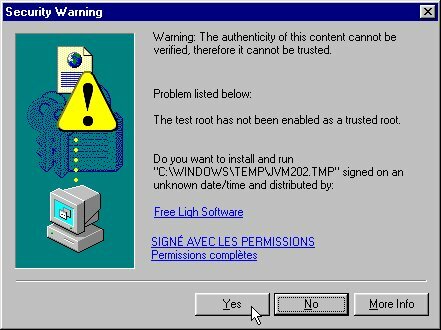 Once you arrive to the page corresponding to your browser (MS Explorer or Netscape), you will receive soon a warning messages. It is because connecting to a database from a java applet is considered a privileged operation and your agreement is necessary to go further. Please answer "yes" ("grant" for Netscape version). If you have already answered no, you should reload that page. Click on the refresh button of your browser while keeping down the control key (Reload button + Shift key for Netscape). If your MS Explorer 4 crashes after answered "yes", it is because your Browser's VM (virtual machine = a small program which interprets the codes written in java), is too old and you need to upgrade it. Please refer to the second paragraph of the page "Trouble Shooting" to know how to do it. After having got the display panel, you should select a database you wish to consult by using a popup menu at the right of the screen. After having selected a database, you should download it by clicking on the "List DB" button on the extreme left. The second button "Find" as well as "Warp" and "Submit" will be explained later, while others allow you to move more easily around a database than the vertical scroll bar, visible on the right of the screen. After 1 or 2 minutes, the data will be displayed on the screen in the form of a table. The data should be read horizontally like tables in Excel. The first column "Main Words" contains the English translation. The second column "Alternative Words" contains alternative translations and spells. The third column "Key Words" contains key-words. The fourth column "Related Words" contains words related to the word of the first column. The fifth column "Web Sites" contains the address of web sites related to the word of the first column. The three other columns are initially invisible. You can visualize them by using the horizontal scroll bar at the bottom of the table. The sixth column "Japanese Words" contains Japanese words in the original spell. The seventh column "Furigana" contains phonetic transcriptions in Hiragana characters. The eighth column "Related Words (jp)" contains related words as 4th column but in Japanese. Finally, a comment on the selected record will be displayed at the bottom of the table. Note: Some strings are too long to be seen entirely. In order to see the hidden part, click again on the already selected field to display a blinking cursor then use the mouse or arrow keys to move it. 1) "Sort by Date/Time" sorts it in a chronological order of creation. 2) "Sort by Western word" sorts it in Roman alphabet order. 3) "Sort by Japanese word" sorts it in Japanese alphabet order. 4) "Sort by Key words" sorts it by using key words. Please note that you can see the result of "Sort by Key words", only after having selected key words. By using the "Find" button in the second position from left, you can seek more easily the records. The dialog window takes different forms according to sort criteria you have chosen. Here are some remarks about its function. 1) If you choose "Sort by Date/Time", you should enter the date in day/month/year format. 2) If you choose "Sort by Western word", you carry out a search in the first column. If at the same time, "Search also in alternative words" is checked, you scan the second column too. Please note also that in this search mode, you don't distinguish minuscule and majuscule letters. 3) If you choose "Sort by Japanese word", you carry out a search in the sixth column. You type Japanese characters by using Roman letters (Romaji) and they will be automatically converted to Japanese characters (Hiragana). 4) If you choose "Sort by Key words", you can have 2 key words. The first one is mandatory while the second is facultative. You can check the number of records which have these words by clicking on the "Check" button. Click then on the "Find" button to display the result. All the records satisfying the criteria will be displayed at the top in the western alphabetic order, while others will be displayed at the bottom always in the western alphabetic order. If the fifth column "Web Sites" contains the address of a site, you can visit it by clicking the "Warp" button. On the contrary, the "Jump" button constraints you to move only inside our data base. If you have several choices, the program allows you to choose the destination by opening a dialog. By clicking on the "Submit" button, you can send directly a query to the most powerful search engines in Japan, Infoseek Japan or Goo. The word to search is on the sixth column and it allows you to avoid retyping Japanese characters. Eventually, you can add some words among dozens of pre-selected ones to refine the result. Pre-selected words are different following to the database. The display technique of web sites written in Japanese is explained at the beginning of the page Manga and Anime Sites in Japan. The list of other Japanese search engines is here. If you have chosen "Geography & tourism" database, by clicking on the "Where" button, you can access to a geographic map which shows an approximate position of the selected locality word on Japanese archipelagos. The "Zoom" button which should show a more precise position is not yet operative.